Today we’re heading for lunch just off the R44 outside Somerset West in the Cape Winelands. Finally! Because I’ve been waiting for my return to Terroir for what seems a very long time! Terroir is on the Kleine Zalze wine estate and opened in 2004. I’m pretty sure I’ve been every year since then! And it’s always an absolute pleasure to sit under the trees looking out towards De Zalze Golf Course, tucking into their amazing food. It’s certainly one of the most relaxed dining experiences you’ll ever have. While we pondered our choices, the breadboard arrived to sighs of delight. The bread was served with a babaganoush puree, sage butter and smoked olives. 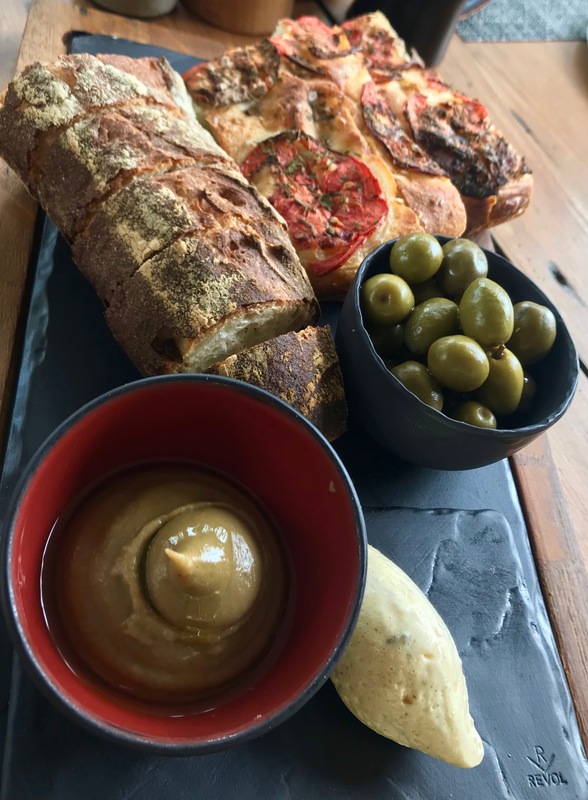 Slices of ciabatta and tomato bread, still warm for the oven made the perfect partners to the silkily indulgent sage butter and the amazingly sweet and intense babaganoush puree – so good I’m going to have to make some myself. There’s a choice of four starters and four mains, chalked up on the large blackboards. 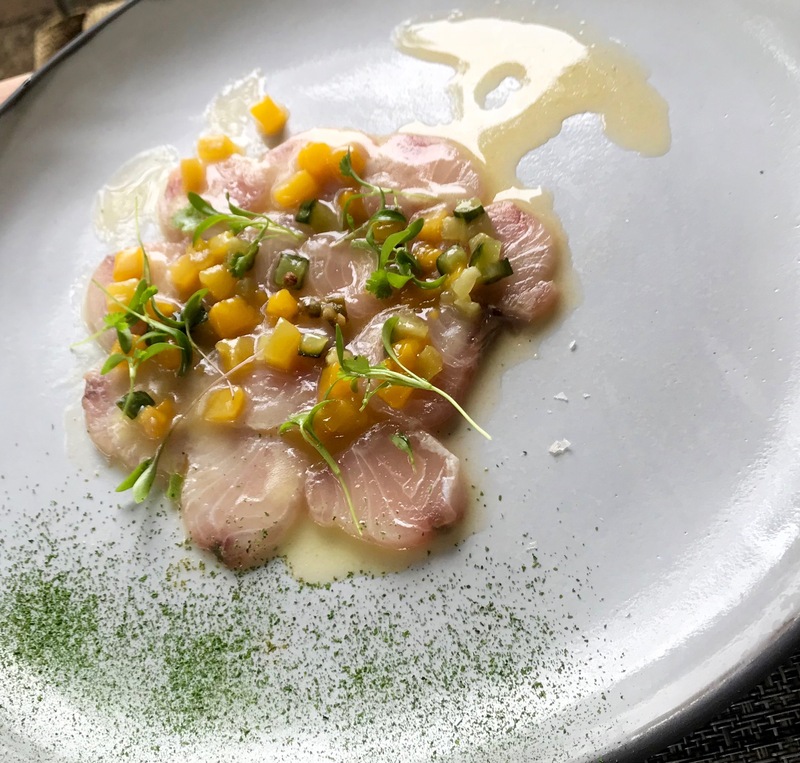 The yellowtail ceviche was served with mango chipotle and a zingy grapefruit dressing. The perfect mix of sweet and sour with thin slices of melt-in-the-mouth fish. Another perfect summery dish. 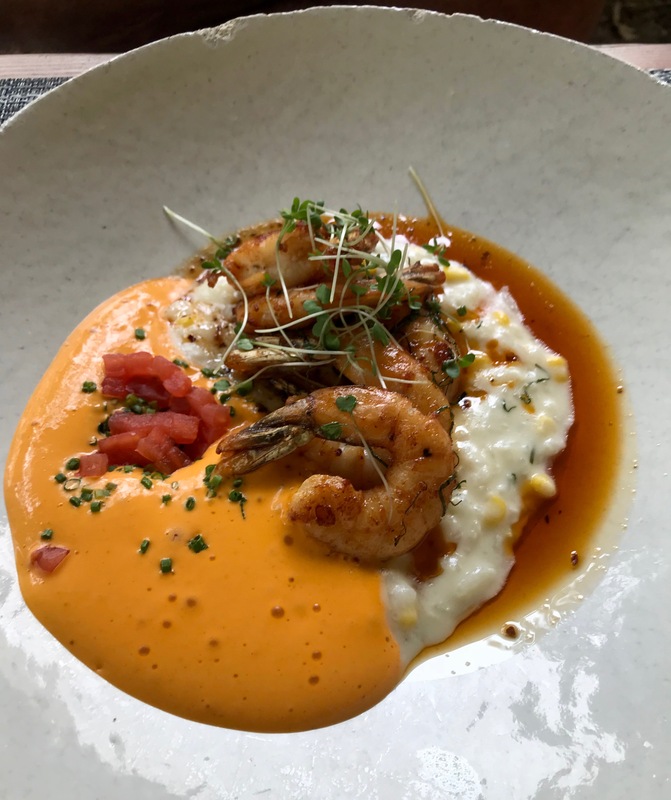 Terroir’s prawn risotto is legendary, served with the spicy Americaine sauce and topped with flavoursome prawns. It’s so creamy and bursting with flavour you almost want to cry. 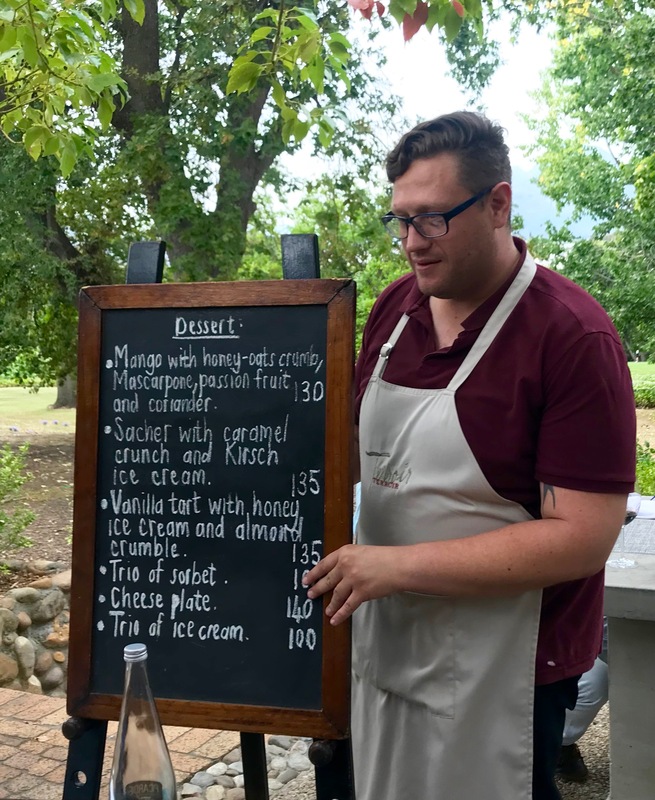 This is the restaurant’s signature dish and the only thing that remains permanently on the menu – apparently when chef Michael Broughton tries to take it off the protests can be heard echoing through the Winelands. Quite right, too. And now for an onion tart – something I’m very partial to. 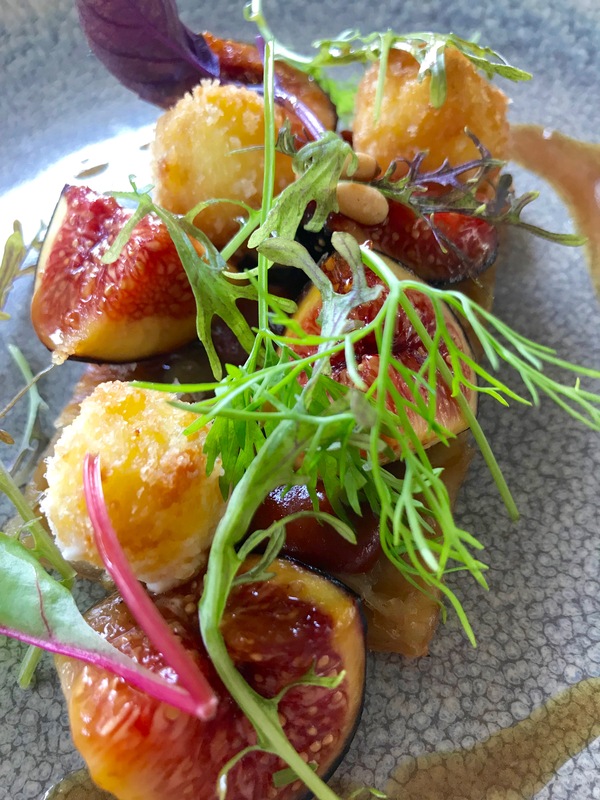 But this is no ordinary onion tart, with its crumbed goats cheese, honeyed figs, sage and sweet barbecue sauce atop the lightest, crispest sheet of pastry. The crunchy balls of cheese were quite a revelation and the amazing balance of sweet and savoury meant every mouthful seemed to dance in my mouth. One of my dining companions muttered between every mouthful about ordering another one…it seemed too good just to settle for one helping! Because it was so good I have to show it to you twice. 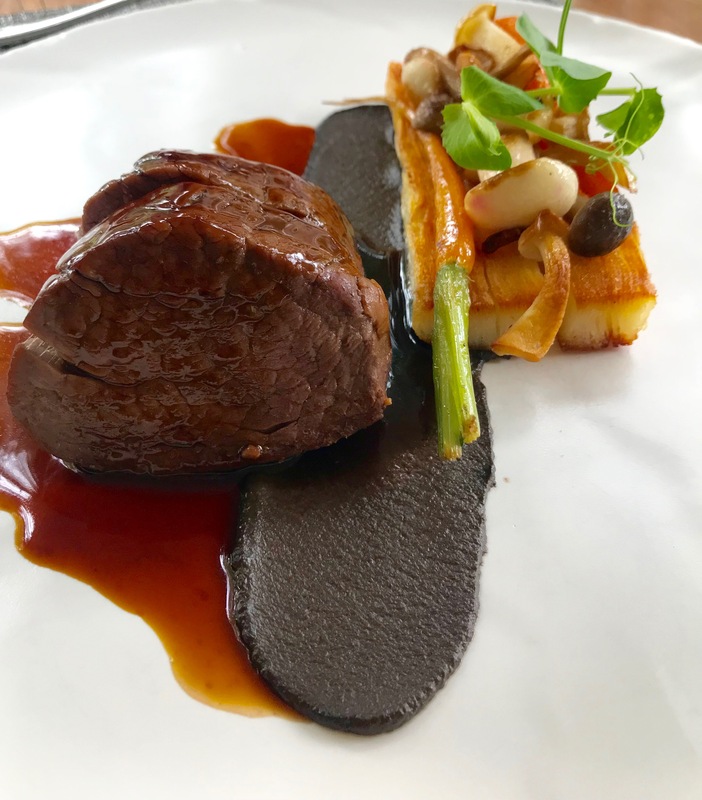 The beef fillet was served on a swoosh of mushroom puree with Anna potatoes and baby carrots. I don’t know who Anna is but her potatoes are something out of this world. And that mushroom puree pulled all the elements together so beautifully. Pretty as a picture, too. 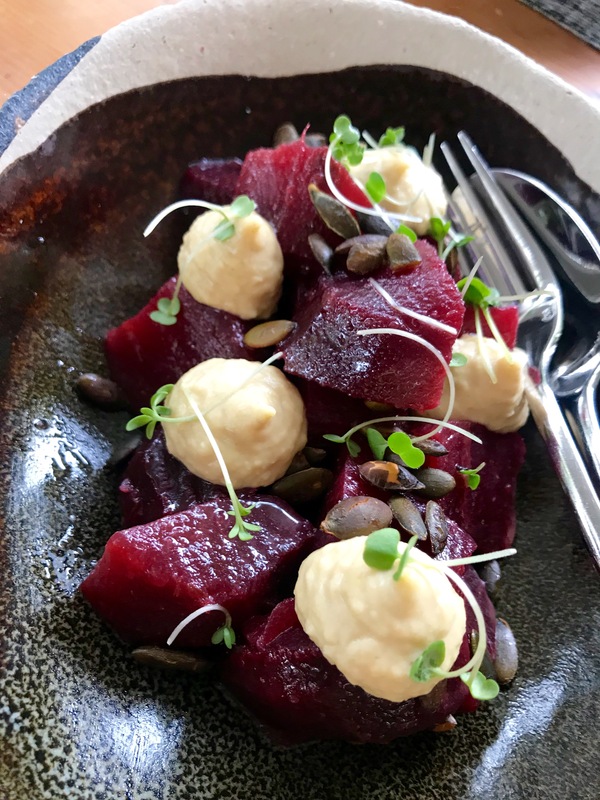 For a side we shared a dish of beetroot, hummus and pumpkin seeds. A totally yum combination. 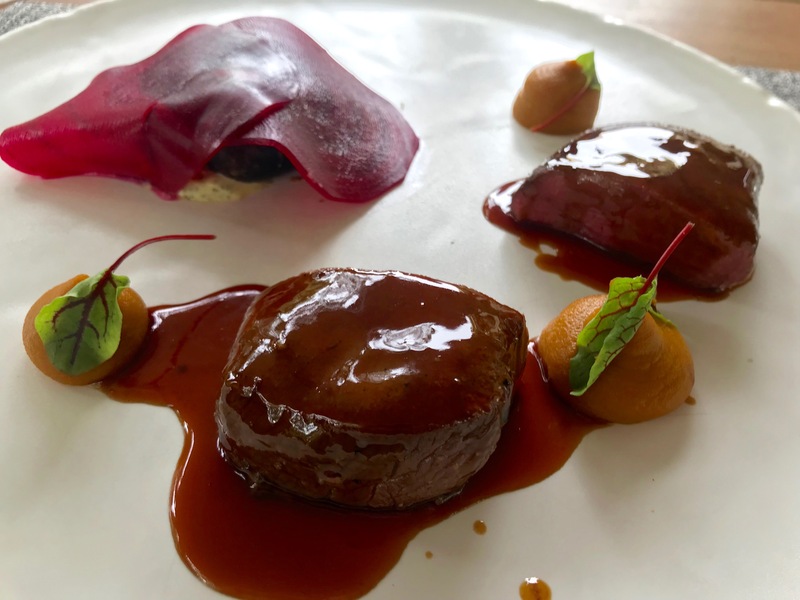 Seared springbok loin comes with dollops of vibrant pumpkin puree, beetroot, gingerbread (which is nestling under the beetroot) and the most incredible whisky sauce. 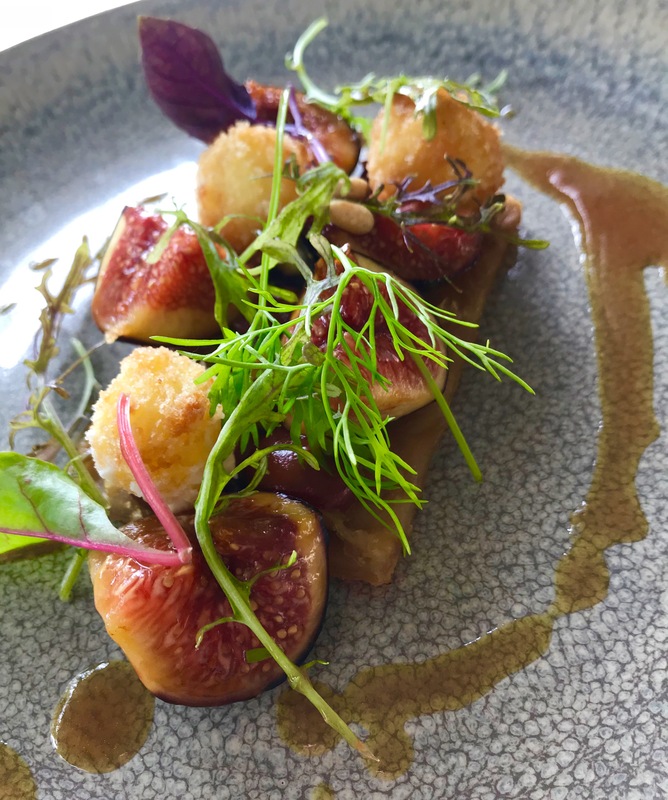 The combination of flavours and textures in this dish produced something totally heavenly. My mouth is watering just thinking about it. Seems like I can almost taste it! 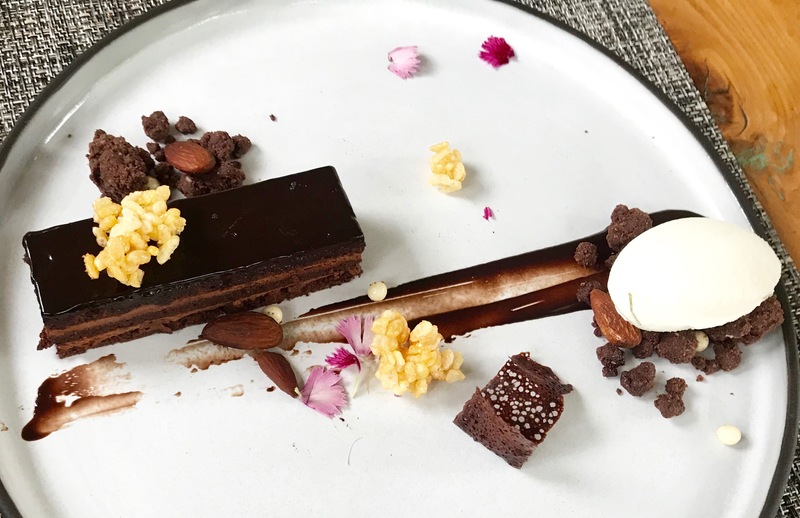 Terroir is one of those places where you simply can’t resist the puddings – and nor should you – they are truly memorable. 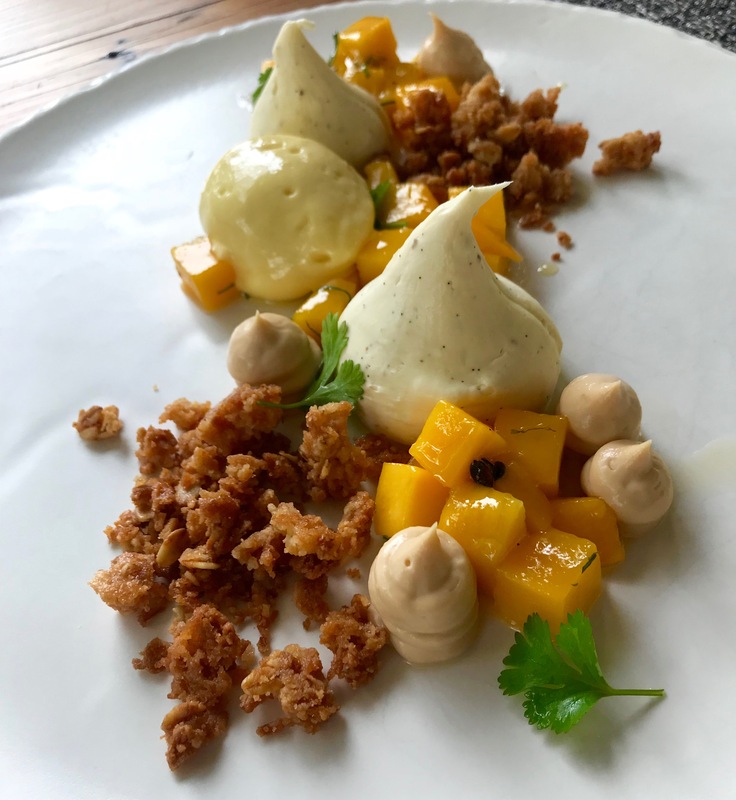 This beautiful concoction of mango served with honey oats crumb, mascarpone, passion fruit and coriander again offers the incredibly perfect combination of flavours and textures. And for those with not much of a sweet tooth there’s always the cheese plate. Substantial chunks of cheese perch on top of a crisp flat bread with the sweetest of pickled grapes and a zingy chutney. Clever! The Sacher comes with caramel crunch and kirsch ice cream. Sacher is a type of chocolate cake or torte that was invented by Austrian Franz Sacher in Vienna in 1832. Clever him! This wonderful version of the dish that will certainly satisfy even the most demanding of chocolate lovers. 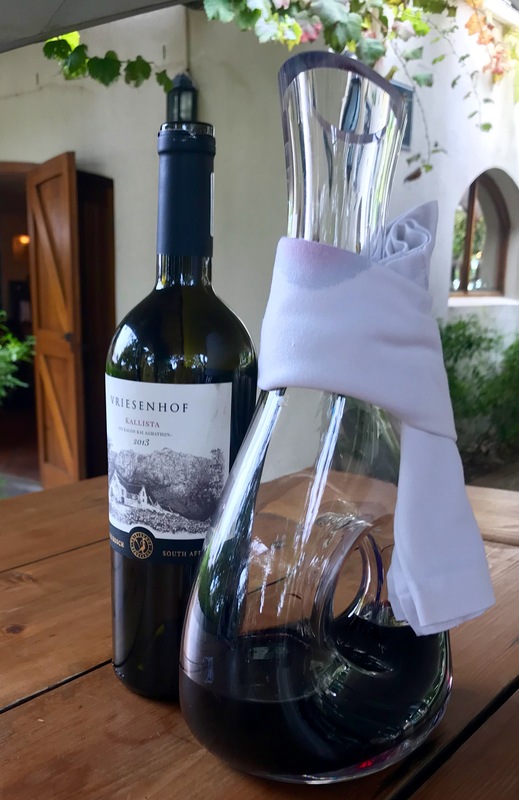 As well as the lovely wines from the Kleine Zalze farm you’re eating in, there’s also a good selection of others – so you’re spoilt for wine choice. Terroir is one of the top restaurants in South Africa and one of my favourites in the world, yes the whole world! Consequently it’s a bit of a more expensive dining experience than most of the meals we’ve enjoyed recently. 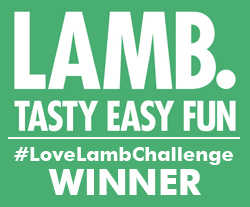 Having said that it’s still on the low side for such a great experience – amazing value for money. 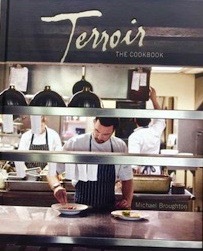 I was so inspired by my sublime lunch at Terroir I left clutching Michael Broughton’s recipe book, determined to create some of his amazing dishes at home. Wish me luck! I might even invite you round for dinner! Terroir is on Kleine Zalze Wine Estate just off the R44 between Somerset West and Stellenbosch. Love this place. We always have such a wonderful lunch there.